Oh, this is a very old draft. But I might put it up just in case someone reading happens to be in Whitechapel. Here goes…..
PS I would include a picture but this food really isn’t that photogenic. I don’t mind a queue. I’d exchanged a raised eyebrow with the woman in front of me and was quite enjoying the Friday night buzz and the anticipation of a hard-won table. Until the German in my life arrived. He immediately declared the queue ‘ridiculous’, and refused to stand in it. I argued that we should wait for our friends to arrive and then decide. There was bound to be a mass table-turning soon. As it happened, five minutes later a table near us was vacated. Someone, far ahead at the start of the queue, was in luck. ‘I’ll just sit down for a moment,’ said my companion. He plonked himself on the table as it was cleared, ‘resting his legs’ was I believe the phrase he used. New cutlery was laid. A trio of yogurts and chutneys appeared. And then a plate of poppodoms. I averted my gaze. This was a two-hour queue he had jumped. Nibbling cautiously, and then confidently on a poppodum, he made it clear to me he did not care. ‘Come and sit down,’ he said. I’d made friends in this queue. How could I just sit down? He was getting annoyed now. Finally I decided to walk outside, remove my glasses, put my hair down and join him as a new person. In any case, with my glasses off I couldn’t see anyone in the queue anymore, so the feeling of mortification was diluted. Then came the food. Smooth chilled mango lassi. Spicy tender lamb chops. Lemony fish curry, earthy spinach paneer, meltingly sweet lamb curry and soft, garlicky naan bread. As I left the woman who had been in front of me was still patiently queuing. I did feel bad. But also extremely well fed. Tel: 020 7247 6400 , 020 7247 9543 , 020 7247 8521 (yes, three numbers. Very popular). 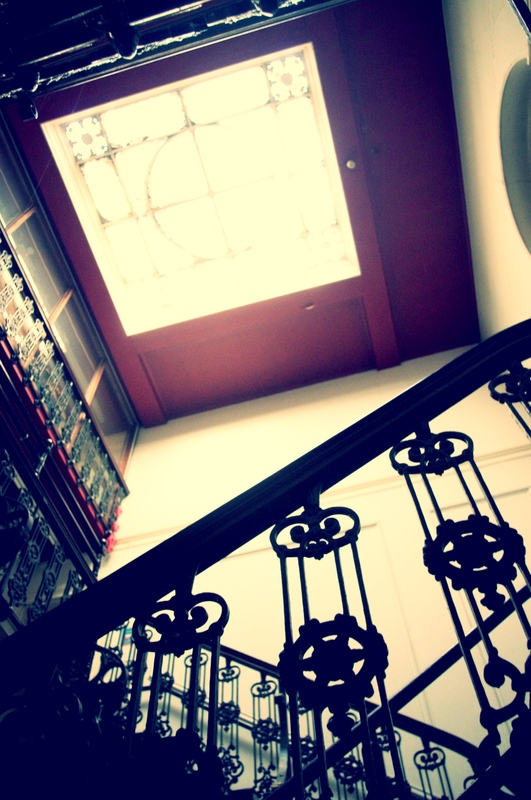 I recently received an email about the Limehouse Town Hall Bazaar & thought I’d mention it here. If you do go along, be sure to have a beer in The Grapes, a beautiful old pub on the Thames. If you are looking for something to do with your family or want to see what is happening with different community groups in the Tower Hamlets area, pop on down to Limehouse Town Hall on the 31st March. To celebrate the completion of badly needed roof repairs, Limehouse Town Hall Consortium Trust are holding a bazaar in the grand hall of the Victorian building. Entry will be free. It will be a rare chance for the public to get a good look at the interior of this beautiful classical building. The building, designed by A & C Harston, was opened in 1881, and is now being renovated and developed for community use. Local community groups, such as Stitches in Time and Hackney & Tower Hamlets Friends of the Earth, will be hosting various stalls and informal creative workshops will be taking place throughout the day. Come join Jamie and Darren for some crafting at their ‘Sparks Themed Arts and Craft Spectacular Stall. Bring some money to take away some lovely plants at the East London Garden Society Stall or sample some fine and tasty cakes. We will have entertainment by both jazz singer Chantal Santos and folk singer/ songwriter Caroline Grannell plus a display of photography by local photographer Marian Spiers. There will also be an opportunity to see what the plans are for the building, and to give the Trust your ideas for, and memories of, the place. The hall was used as an entertainment venue for much of its early life. Musical performances were a draw for hundreds of local people, who packed the main hall and public gallery to capacity. Dance classes were held here in the 1890s, and cinematograph performances used to take place regularly. The inspiration for this event, celebrating a key phase of the current renovation, came from bazaars that took place at the hall around the turn of the century. These were often held near Christmas, and incorporated side-shows, art exhibitions and stalls. The hall was a bustling hub for the local community, both for leisure and for their civic necessities, and the bazaar will continue this tradition. If there’s one thing that East London has in abundance, it’s art galleries. With well over 100 to choose from, there are enough to keep ardent art lovers going for years. The fantastic First Thursdays initiative offers a wonderful way to dip your toe into East London’s art scene for free, but if you’re just looking to amble along to a couple after work or while on a short break in London, here’s a brief introduction to some of the best. Okay, so everyone knows about the Barbican, but it would feel a little strange talking about galleries in East London without mentioning it. This is the place to go if you want to see works by huge international artists before taking in a film, concert or dance performance – it really is a great all-round arts venue. Another big player, Whitechapel Gallery is the organiser of the aforementioned First Thursdays scheme and also awards the well-respected Max Mara Art Prize for Women. Lots of big names have exhibited here and the venue holds many fascinating talks, workshops, children’s events and more throughout the year. You might come across the next big thing if you visit Chisenhale Gallery. This vibrant space housed in a converted 1930s factory prides itself on hosting exhibitions highlighting the work of new artists. Look out for displays of art by Lynette Yiadom-Boakye and Amalia Pica later this year. Limehouse Gallery provides the opportunity to see some quite frankly amazing bronze sculptures right next to where they were made. Sharing a site with the Bronze Age Sculpture Foundry, the venue showcases works by artists in the UK and the rest of Europe. It also occasionally exhibits paintings, stone carvings and art in other media. Now for something completely different. Quirky, delightful and sometimes shocking, the exhibitions at Viktor Wynd Fine Art aim to promote an eclectic range of artists – upcoming events include an ancient Egypt-inspired display of work by James Putnam and an exhibition relating to the late Sebastian Horsley, who once attempted a crucifixion to inspire his painting. Viktor Wynd himself is an artist who helps run The Last Tuesday Society, which holds spectacular balls and parties, as well as lectures delving into all kinds of weird and wonderful subjects. The setting of this arts centre is just as fascinating as the exhibitions it holds. The Wapping Project has preserved much of the interiors of the original 19th-century power station it’s housed in, treating visitors to chains, pipes, brick walls and other industrial features against which all kinds of art are displayed. A restaurant and bar can also be found onsite, so this could be a great destination for a full day out in East London. The well-respected Matt’s Gallery has a reputation for commissioning installations that go on to achieve considerable fame. Perhaps the best known of these is the engine oil-soaked 20:50 by Richard Wilson, which is the Saatchi Gallery’s only permanent installation. The gallery is a definite must-visit for art that really makes you think. Vyner Street Gallery is another venue ideal for discovering new talent. Specialising in student and graduate exhibitions, this is perfect for seeing what the cutting edge of contemporary art looks like. Who knows? You might end up purchasing an artwork that’s worth a small fortune in a few years’ time! This is just a handful of the wonderful art galleries you can visit in East London. Post your recommendations in the comments below. One of the key bits of advice I was given by baby books was ‘meet other mums’. It’s a bit like starting a new job and getting to know your colleagues, you see. So once I’d had the child I dutifully took myself off to Tiny Toes mothers’ group, baby swimming lessons, music sessions and yoga. It was all rather exhausting, but I did meet a couple of like-minded souls, so it was worth it in the end. After a while we sort of naturally outgrew Tiny Toes, in that my son is not a small child and I no longer felt the need to recount my birth story in visceral detail to anything with a pulse, which seemed to be the main therapeutic function of Tiny Toes. And then I was informed that my son would need to repeat Stage One of swimming lessons, as he didn’t like being dunked underwater, and that brought up a lot of my issues about being picked last for sport, so we ditched that. And yoga was at the local Surestart children’s centre, so got axed, obviously. The only group we stuck with, albeit sporadically, was Music & Movement at the Sebright Children’s Centre. The session is run by a musician called Coram. He’s a bit of a character, takes great pleasure in yanking dummies from babies’ mouths and hurling them at the mothers, and sometimes doesn’t show up because he’s at Glastonbury with his band or some other glamorous excuse. It’s standing room only at his sessions. You sing, bang drums, fling children around and generally have a ball. Movies at the Rich Mix in Bethnal Green and the Rio in Dalston. A godsend in the early days as a kind of dimly lit retreat from the shock of it all. Rich Mix also has a play session with a qualified movement therapist. Slightly pointless if your child doesn’t actually move yet, but I had a fascinating conversation with a crime scene investigator mum so it was worth the trek. London Fields Lido is nice on a sunny day if you bring a couple of mates and take turns to swim. Hackney City Farm is awesome – homestyle Italian food and the odd guinea pig or donkey wandering about to make it educational. Buggies & Bikes at Broadway Market hold baby signing classes and other things. Up in Stoke Newington you have baby swimming lessons at the Sunstone Women’s Gym and Mothers Talking sessions with Naomi Stadlen, author of the brilliant What Mothers Do (Especially When It Looks Like Nothing) and How Mothers Love, which I’m still to read. Hackney Library has singing sessions and a good book selection. And don’t forget to get your Real Nappies For London cloth nappy voucher from Hackney Council – pictured above. Ok, you might not use them all the time, but even one nappy a day means 365 fewer a year into landfill. But if you stay in your PJ’s all day then that’s fine, too. Other suggestions/tips welcome. So I was on the bus back from Borough Market yesterday, with a belly full of that holy trinity that no Michelin-starred restaurant will ever come close to – a Monmouth flat white, a rocket and chorizo roll and a crème caramel from the French buttery (and may I point out that I am doing the equivalent of 12 hours weight training a day, my son is not a small child) – when a man began yelling into his mobile about how quietly he had spoken. I’ll call him Cyril as that’s the sort of man he was – crisp white trousers, a baggy blue chambray shirt, an older, yet curiously unaged face (confirmed bachelor, no children, I suspect) and a floppy sort of hat with a rustic little twig sticking out of it. It appeared that his friend, a woman called Jillian, was ticking him off for talking too loudly about another neighbour – clearly a sworn enemy of them both – in what sounded like a communal garden. What was odd about the conversation was that although he denied talking loudly, his voice was reverberating through the entire bus. Silence as Jillian said her piece. Aha. At this point he got off, still bellowing into the phone, and silence was restored. And of course, no one gave any indication of having heard a word. I was working as a scientist in East Berlin when the wall went up overnight in 1961. My 15-year-old daughter was staying with my mother in West Berlin that weekend, so I didn’t see her for two years. Eventually she was granted a visa and visited me a few times, but it was very stressful. She had to queue for hours and go through a heavily guarded checkpoint, always dreading an interrogation or body search. By 1967 I was desperate to escape. My sister, a ballerina, had committed suicide in West Berlin, and my request to attend her funeral was turned down without explanation. I realised then how cruel the system was, and I felt very lonely. All I wanted was to get out. I was prepared to take the risk because even if I was caught and imprisoned I would be set free after a few years. It was widely known that the West German government paid a substantial amount of money per prisoner to the East Germans, who were desperate to boost their economy. Three years in prison was nothing compared to a lifetime in East Berlin surrounded by barbed wire and a wall. At the time no one thought that the wall would eventually come down. My mother organised my escape. She contacted the Red Cross and through them found an American organisation that would smuggle me out for 30,000 DM (14,000 GBP) – all her savings. I had to meet the mediator at a café. As we talked we had to look relaxed, in case there were Stasi agents watching us. He told me to book a holiday at the seaside resort of Varna in Bulgaria, where I was to stand outside the post office every night at eight o’clock, wearing a white coat so the courier would recognise me. My daughter smuggled my important documents, such as my university degree and birth certificate, across the border under her clothes. Because of my work as a scientist I was considered trustworthy by the GDR, and granted a travel visa. At Varna I stayed in a hotel for East German tourists. We all had meals in the hotel restaurant, which gave the authorities a chance to count people and ensure no one was missing. An undercover Stasi agent usually accompanied tour groups, posing as a guide or traveller. You never knew who it was, but you knew they were there. To disguise my intentions I established myself as a party girl, staying out late in nightclubs so people wouldn’t immediately raise the alarm when I didn’t show up after a night out. During the day I rested. I shared a room with another woman and the lack of privacy was stressful, as I had no chance to reflect on what I was about to attempt. I felt exhausted from the effort of acting normal. Each night I stood outside the post office in my white coat, a camera over my shoulder to look like a tourist and my DDR passport in my pocket. I felt very focussed on my escape, but after a week no one had come and I started to panic. On the eighth night a young man approached me, and I recognised him as an old university acquaintance. He gave me directions to a meeting point, then I returned to the hotel for dinner so the alarm wouldn’t be raised. Afterwards I left as if going to a nightclub. It was a long, eerie walk past tobacco fields to the meeting point. It was getting dark and I felt very lonely. Suddenly along came a massive beige car with American diplomatic number plates. In the car was the boy I knew, along with a driver. I sat in the back of the car and we drove to the Yugoslavian border. Just before we got there we stopped in a dark forest. The driver pressed a button on the dashboard and to my amazement it opened up, revealing a space just big enough to squeeze into. Once in, I found it bigger than it looked, with enough room to lie down. When we arrived at the border I could hear the guards asking questions, and I felt ice cold, totally alert and immersed in the situation. Because the car had diplomatic number plates it was unlikely to be searched, but I knew that the alarm had probably been raised at the hotel. We drove down many isolated donkey tracks and through fields in Yugoslavia, staying in cheap hotels along the way. It took about four days to get to the Austrian border, and whenever we travelled through a town or checkpoint I had to squeeze back into the chamber. Finally we reached Munich, and I boarded a flight to West Berlin’s Tempelhof airport. I arrived with only my handbag, after a journey that would have taken less than an hour by train. I felt so relieved and happy to see my daughter and my mother. I had to report to an escapee intake centre, where I was interrogated by the Germans and each of the Allies, first the Americans, then the British and finally the French. They all asked the same questions – where did you live in East Berlin, and what do you know about the Russian military? I was granted refugee status, but the authorities advised me to leave Berlin because scientists were sometimes kidnapped back by the East Germans, so I registered with the job centre, and found work as a high school chemistry teacher in North Germany, where I still live today. Finally normal life could begin. The news is simply bilious with riot coverage at the moment, and there’s nothing I can add that hasn’t already been said with far more eloquence and devastating accuracy elsewhere (I thought this piece by Zoe Williams was particularly good). So I thought I’d write instead about the Japanese domestic interiors exhibition at the Geffrye Museum (on until 29 August). I visited last Friday, and although it’s a little thin in parts I still liked it – ever since David Mitchell said something (or perhaps he was quoting someone else) along the lines of ‘all countries are different, but Japan is differently different’ the country has become something of an obsession. The Japan rooms at the British Museum only fuelled it, and just yesterday I received in the post, all the way from Shibuya Publishing, Japan, a copy of Art For All magazine, which featured a blog I wrote mentioning Gilbert and George. My bloggerly cup spilleth over. 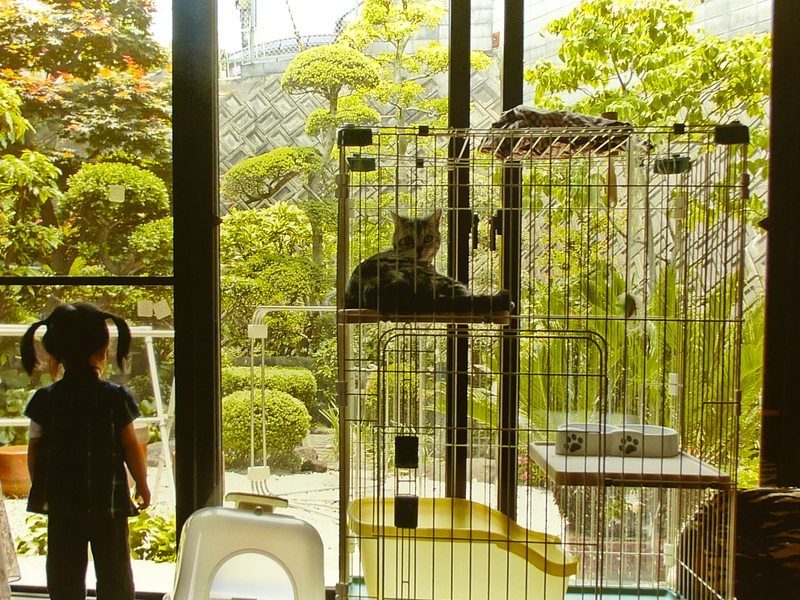 Anyway, I learned a few things at the exhibition about Japanese homes. Firstly, toilets are considered unclean (obviously) so you would never have one in the same room as the bath or sink (or, presumably, carpet the loo, as I have seen here). And while you wear house slippers at all times in a Japanese home, you change these for special toilet slippers at the appropriate time. I like that. Also, dolls are often given as gifts by grandparents (nothing new there). They are thought to protect the children as they grow up. Dolls must be treated well or they can cause bad luck; when stored, their faces must be covered, and old and unwanted dolls must be ritually disposed of at temples and shrines. Now this I also feel is very wise – like many people, I find some dolls disturbing, and I think the idea of treating them carefully is a good one. I remember reading a book set on the Welsh coast about a girl who is given a wooden doll – I think it was called Dodi – and it causes all sorts of trouble. I’d love to read it again actually, and see if it’s still as terrifying (editing it: it’s called A Candle In Her Room & the secondhand paperback is currently going for about 30 quid on Amazon. Hunting it down also reminded me of my whole teenage Lois Duncan phase – Killing Mr Griffin, Stranger with my Face, Trapped in Time – she wrote brilliant teen thrillers). 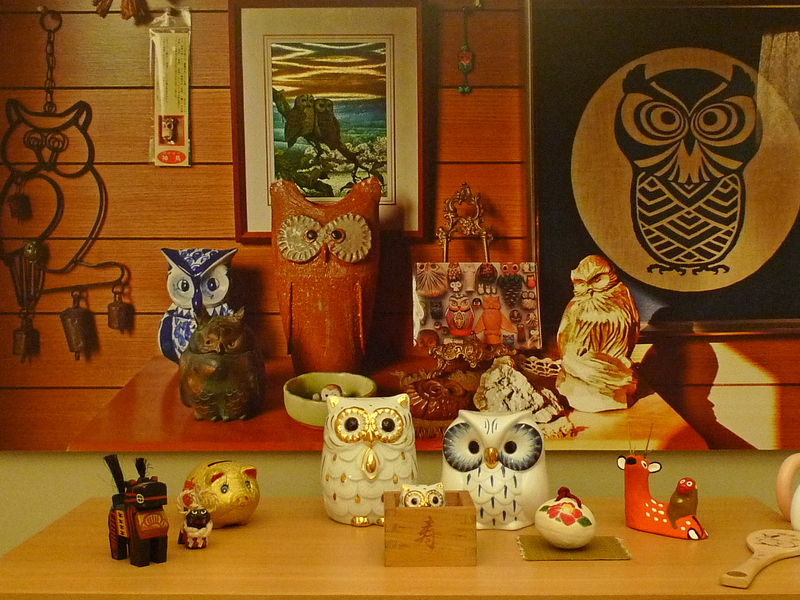 Finally, the entry of the home is considered spiritually hazardous, so lucky owls and cats are displayed on top of the shoe cupboard as protection. Bugger. Baby squawking. Back to ball training (the kid’s got talent).